The Dragon of Dojima is back for one last adventure across the mean streets of Kamurocho, and there’s plenty of work to be done. 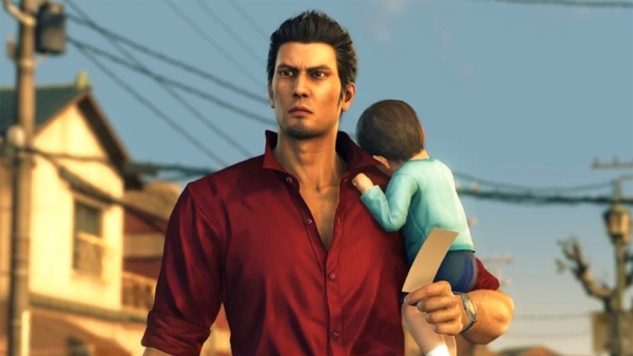 It can get pretty tough out there, especially since old man Kiryu has become nothing short of a legend among the various families and crime syndicates of Tokyo and beyond. Thankfully we’ve shaken down every thug, played every game of Mahjong, and sang every karaoke song we could find to bring you these seven helpful tips to make your time in Yakuza 6 go as smoothly as possible. Throughout your travels in Yakuza 6 you may come across several items and accessories that can go into one of two equipment slots, providing passive bonuses to your stats and defenses against the various weapon types. While most of these items tend to be focused on boosting one specific aspect, there is an item you can acquire early on that gives you a handy boost to four of your stats all at once, so it’s worth taking a minute out of your daily yakuza dealings to grab it and give yourself an edge in combat. The item in question is called Steel Underwear, and can be found inside the locked safe in the mahjong parlor on the fourth floor of the Lullaby building opposite New Serena. At the very start of the game when you first arrive in Kamurocho, you may notice that there’s something shining on the staircase inside the ground floor of the building behind the police officers. To open the safe, head on over to the staircase once the police are gone and interact with the shining object to get the key, then climb the stairs until you reach the mahjong room. Walk into the back office at the end of the room and the safe will be sitting in the corner. By equipping the Steel Underwear, you’ll give yourself an immediate +5 bonus to attack and evasion, and a +10 bonus to defense and heat gauge. As you punch your way through the course of Yakuza 6, you’ll steadily accrue a number of different color-coded experience points, each one linked to a specific attribute. These different experience points can be spent upgrading Kiryu’s skills, from new heat takedowns to stat increases and passive boons on social interactions. These upgrades vary in scope and use, but the important thing to note is that they can often be upgraded through multiple levels, with each one costing more the higher you upgrade it. XP is awarded for completing any number of tasks, but different tasks often reward different types of experience. The most notable instance of this is during fights, which award you a small amount of Strength (Red), Agility (Blue), and Spirit (Orange) but not Technique (Green) or Charm (Purple). For the most part, earning experience simply boils down to completing tasks. By finishing off main missions, Troublr tasks, sub-stories, and dabbling in the occasional minigame, you’ll soon see those points rising up fast. There is also an upgrade tree for each experience type that will boost the amount earned, and getting these skills early on will have a dramatic effect on the amount of experience you earn later in the game when the rewards become much more substantial. Eating is also a great way to amass a steady top up of experience points, and is especially useful when you’re walking around town with low health. There are a number of different places to eat, and each place offers a variety of meals that grant any number of combinations of the experience types. You can only gain experience from food so long as your stomach is not full, however, so make sure to keep an eye on the hunger and top up whenever you can. Upgrades can also be bought to increase the experience earned when eating, as well as the cap on your hunger meter, allowing you to eat more, but these should come secondary to the skills that boost each experience type mentioned earlier. The most difficult experience type to earn throughout the game is Technique, simply because while it and Charm aren’t earned through combat, Technique is still required for a number of combat upgrades where as Charm isn’t. You can overcome this by either spending some time at the batting cages, which will offer you a modest sum of Technique experience with each completed session, or by choosing to eat a number of dishes at Sushi Gin, which can be found on the southwestern edge of Kamurocho. It’s worth pointing out that while this code is no doubt useful, accessing the lump sum can detract from the fun of having to fighting your way towards those riches. Be sure that you’re happy with being a millionaire before opening the vault, because once you’ve lined your pockets to the brim it will be very difficult to spend each and every Yen. Quick Recovery: This allows you to press X when being knocked down to get up faster. Throughout the course of the game you will meet a large number of enemies that are more than capable of taking you off your feet, so having this skill handy makes it much easier to recover and carry on the fight. Relentless Blows: Enemies will block often, and by having this skill unlocked you will be able to continue attacking much faster after an attack has been blocked. By having this, you can often overpower blocking enemies with a full combo, breaking through their defenses and landing a knockout blow in the process. Double/Triple Quickstep: Quickstepping is much more muted in Yakuza 6 compared to previous entries. At the start of the game you only have a single quickstep which rarely removes you from the area of an attack, so getting the double and triple version of this skill affords you much more mobility during combat. Collateral Damage: Enemies will often swarm you in groups, so grabbing this skill will help you dish out extra damage to anyone unfortunate enough to be caught by a large sweeping attack that hits multiple foes. This skill is especially useful when using the roundhouse kicks or large weapons like the bicycle. Boost Heat Actions Level 1/2/Max: By upgrading the damage dealt by heat actions you can deal a considerable amount of damage with your heat takedowns. These are great at taking down larger, tougher enemies in one go, so make sure you level this skill up when possible. Combat can get pretty tough in Yakuza 6 as the enemies don’t wait around for their turn to strike like they used to in previous entries. Skirmishes now often involve several angry punks wailing on you from all angles, and it can be easy to get overwhelmed and overpowered when fighting off your enemies. Fortunately, Kiryu’s enemies are just as susceptible to the same new restrictions that he is, and if you’re clever, you can make the most of the new physics-based combat to control the battlefield. The important thing to remember is that most heavy attack combo finishing moves (Square>Triangle etc…) will cause enemies to fall down. Once knocked down, enemies can’t block and are easy to attack repeatedly. If you continue to use heavy combo finishers while the enemies are staggered and prone, you can often keep them knocked down indefinitely, and since most of these finisher attacks strike in a large radius, this can be used to control entire groups with ease. Some of the toughest fights come in the form of boss battles against key figures of the story. It’s here that Yakuza often likes to play dirty, with many of these enemies sporting their own enraged mode that makes them difficult to stagger and knock prone. In these fights, you should always try to find weapons scattered around the environment. Heat takedowns with weapons do a considerable amount of damage, sometimes taking off upto a quarter of the health bar off with each attack, so if you’re struggling to take down a particularly nasty foe, just reach for the nearest bar stool or traffic cone. Fair warning for anyone concerned about spoilers: the next paragraph contains some information about one specific side quest found about three or four hours deep into the game. Skip ahead if you don’t want to know, or want to find it yourself. After spending some time in Kamurocho, you’ll be given an app called Troublr that has you fighting to save innocent citizens across the district. A few Troublr missions deep into this newfound community service and you’ll be tasked with locating a bomb based only off of a photograph. Finding the location of the bomb can be incredibly tricky as you’re only given ten minutes to find and disarm the bomb, and the photo you’re supplied with is quite zoomed in and located in an area many people may never have visited prior to the start of the mission. To locate the bomb, head on over to the Millenium tower and take the elevator up to the roof garden. Once there, listen out for the beeping near one of the staircases leading up from the inner circle in the middle of the area. The bomb will be resting on the other side of the raised wall next to the staircase. To disarm the bomb, cut the red wire, and you’ll get a message from the bomber telling you that you’ve won this time. After spending some time in the sleepy town of Onomichi, you’ll be introduced to the RTS-style minigame Clan Creator, in which you’ll have to organize and lead an army of foot soldiers to fight against an ever-increasing horde of rivals. The more fights you win, the harder they become, so learning how to make the most of your soldiers is the key to success. To start, you should try to have a well-balanced team composition. Each key member you slot into your hierarchy has one or more soldiers that they can spawn on the battlefield. Deploying more than one member with the same soldier type decreases the overall cost to spawn that soldier, so take that into consideration when building your team. During my time with the Clan Creator, I found that stacking members with the regular red soldiers and the white pistol soldiers seemed to work out well. By deploying these two types in large numbers, you can easily build up a cheap front wall to soak up damage while the ranged pistol users unleash a constant volley of damage from relative safety. Key members can also come with skills, but these can vary wildly on their actual usefulness. In truth, the only skill that seemed vital is Masao’s healing buff, which has a fairly short cooldown and can help keep your foot soldiers regularly topped up on health. Since you get Masao at the very beginning of Clan Creator, there’s nothing special you need to do to make this happen. Just be sure to keep him levelled up and on your team, and deploy him early on in the fights to get the most out of his healing skills. If you find that you’re still having trouble with the fights later on, you can always use the Clan Creator code to slot Kiryu himself into your team. By using the code “NoRestForKazumaK” you can place the legendary Yakuza right into the fray, and while he does come as an 80 unit cost card, his ability helps increase overall damage for a few seconds and his stats make him a reliable front liner.